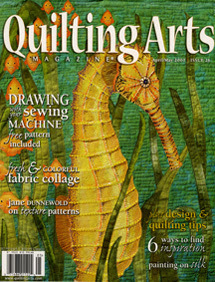 Judy Coates Perez: Fauna Makes the Cover of Quilting Arts! "Here's a sneak peak of our next cover of Quilting Arts. (I just got my advanced copy yesterday). This is a detail of “Fauna”, a collaborative quilt by Kathy York, Vicki Hallmark, Frances Holliday Alford, Judy Coates Perez, and Julie John Upshaw. Never before in the history of Quilting Arts Magazine have we dedicated eight entire pages to a single quilt, but it's that amazing. (I still have this quilt in my possession as we'll be featuring it in our Quilting Arts booth in Chicago.) Subscribers, this issue is being mailed as we speak, and for those who pick up Quilting Arts on the newsstands, expect to see it April 3rd." The seahorse is from Kathy York's panel of Fauna. Congrats on making the cover girl! I am so thrilled that Fauna is making its public debut on the pages of Quilting Arts. Pokey and her staff have done such a fabulous job with showing the quilt, each panel is featured on a seperate page of the magazine with a full page photo. The photography is exceptional. Just wait until you see the photo of Vickies cactus panel, (the reason our quilt was rejected from Houston) it is jaw dropping gorgeous! Wow!!!! What an honor....Congrats....I have been waiting to see you and your art featured in QA. Actually I have been featured in Quilting Arts before. 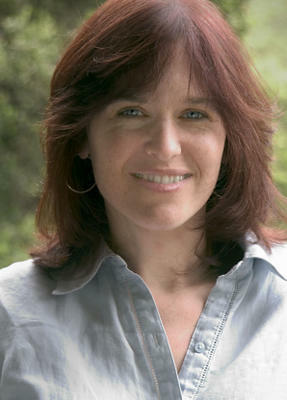 I was the artist profile in issue 19 Fall 2005. Looks amazing - all of your work is Judy. I look forward to getting this issue!